Click on Young Souls to go to 125 magazine’s site where you can watch it. If you want to hear it from the photographer follow the links to Dean writing on his blog in a post Young Souls now live to view on 125 magazine. Looks like it was a fun and successful evening. The film will also be screened alongside an exhibition of photos at The Youth Club Gallery from 22 July – 4 August. However, I can’t find the gallery listed, and can’t see on the PR where it is located, will find out and post details with a pic. Dean also has a show coming up at the Reading Museum The New Faces “depicting a group of young ‘Modernists’ from London” running from 30 July – 4 September. This entry was posted in Contemporary Photography, HotshoeBlog, Photography Shows and tagged 10 Mins, 125 magazine, 22 July, 4 September, Contemporary Photography, Cup Of Tea, Dean, Dean Chalkley, Dean Young, Debut Film, Exhibition, Fashion Photography, Modernists, Music, Music Photography, New Faces, Northern Soul, Photographer, Photographers, Photographers blogs, Photographs, Photography Photographers, Photography., Portraiture, Premieres In London, Reading Museum, Short Film, Short Films, The New Faces, Young Souls on July 19, 2011 by mirandagavin. The 14th edition of Paris Photo turned the spotlight on central Europe â Czech Republic, Hungary, Poland, Slovenia and Slovakia â and included 106 exhibitors from 25 countries. Some 38,000 visitors came to the fair, compared to 40,150 in 2009, a slight decrease in number owing to the fact that there was no late night opening this year. Transactions went at a sustained pace and most exhibitors reported a better volume of sales compared to 2009. Some achieved results that were described as “exceptional,” “astonishing,” “miraculous,” by the gallery owners themselves whose expectations were modest owing to the prevailing economic climate. Sales were good, and even excellent, especially for those galleries whose shows coincided with some of the exhibitions currently on in Paris (Heinrich KÃ¼hn at the MusÃ©e de lâOrangerie, AndrÃ© Kertesz at the Jeu de Paume, Les Primitifs de la photographie at the BibliothÃ¨que Nationale de France) as well as the big photography auctions and the Central European theme. The photograph by Joseph Sudek put up for auction by Johannes Faber gallery went for a record â¬300,750 at the Sothebyâs sale. This brought numerous buyers to the Viennese galleryâs booth at Paris Photo. Another image by the Czech artist went for â¬190,000. Meanwhile, the New York gallery Edwynn Houk, sold the picture entitled Arles (1929) by Hungaryâs Moholy-Nagy for US$ 265,000. Budapestâs Vintage Gallery was showing largely Hungarian modernists and achieved better sales than last year with a total of â¬58,000 for 22 vintage pieces sold. Franceâs FranÃ§oise Paviot sold her self portrait of Man Ray for â¬75,000 and the entire set of small contacts by BrassaÃ¯ made in 1958 for between â¬2,500 and â¬4,000 each. Obsis gallery of Paris sold its entire collection of images of the 1931 colonial exhibition held in Paris to a Paris museum for more than â¬100,000. A specialist in anonymous photography, the gallery LumiÃ¨re des Roses (Montreuil) sold two thirds of the works on its booth, and in particular 8 autochromes (1925/1930) by LÃ©on Gimpel at â¬7,000 each. Surfing on the current wave of enthusiasm for photographers who worked in fashion (Avedon, Irving Penn, Guy Bourdin, Helmut Newton…), Hamiltons Gallery of London sold the famous Mainbocher Corset (1939) by Horst P.Horst for US$ 150,000. Filles du Calvaire (Paris) gallery recorded its best sales ever at this yearÂ´s Paris Photo. alabama foundation repair . The gallery let go of three editions of a portrait by Paul Graham from his End of an Age Series, 1996-1998 at â¬24,000 a piece to buyers who included some Turkish newcomers to the fair. SAGE Paris sold his entire collection of the light-boxes made in 1999 by Japanâs Naoya Hatakeyama, ie. some 30 works costing â¬6,000 each which went to the Getty Museum in Los Angeles, the Museum of Fine Arts in Houston and to a Brazilian foundation. Berlinâs DNA gallery sold 80% of its wares including two large format staged images by Japanâs Tatsumi Orimoto at â¬38,000 each and two videos by Bulgarian artist Mariana Vassileva costing â¬ 8,000 each. New Yorkâs Yossi Milo recorded better sales than at his last participation in Paris Photo in 2006 with some 40 works priced at between â¬6,000 and â¬10,000 acquired by new collectors from England, the USA and France. With its artist GÃ¡bor Åsz as the winner of the 2010 BMW-Paris Photo Prize, Loevenbruck (Paris) found buyers for four of the Hungarianâs unique pieces at â¬20,000 each. Book sellers also reported very good sales this year: Toluca sold 20 of its 28 copies of Â«Â What Man is really likeÂ Â» by Rachel Whiteread, Ingo Shulze and Naoto Fukusawa for â¬7,000 each. Librairie 213 let go of some 20 rare books with the most expensive costing â¬12,000. Man Rayâs book entitled Electricity (1932) offered by Denis Ozanne at â¬35,000 also found a buyer. Visitors, collectors, institution directors were unanimous in their praise for the high quality of the exhibits, the beauty of the works and their excellent presentation as well as the good number exciting discoveries that arose from the exploration of the Central European scene. Firmly anchored in a rich historical ground, the Czech, Polish, Hungarian, Slovenian and Slovakian scenes are today undergoing a renaissance. In addition, the exhibitions of the finalists of the BMW-Paris Photo Prize, Leica Cameraâs show A Juste Titre as well as the SFR Young talents show won many accolades from the public. This year Paris Photo coincided with a number of key auctions, including the Avedon sale at Christiesâ and a big auction at Sotherbyâs. It also took place in the context of the 30th anniversary of Photography Month which offered a plethora of exhibitions throughout the city, in addition to a number of “Off” fairs and happenings. 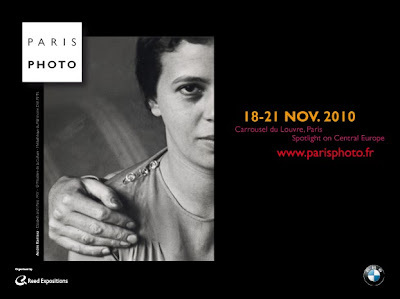 More than ever, Paris Photo is the worldâs leading event for photography and Paris is its global capital in November. * A writer, art critic and independent curator, Simon Njami conceived the exhibition Africa Remix, the first Africa pavilion at the Venice biennale in 2007 with Fernando Alvim. He was also behind A Collective Diary (Tel Aviv 2010) and A Useful Dream, fifty years of photography in Africa (Brussels, Palais des Beaux-Arts, 2010). Njami was co-founder of La Revue Noire and served as its Chief Editor. He was director of the Bamako biennale for 10 years and his latest book is a biography of LÃ©opold SÃ©dar Senghor (Fayard, 2007). This entry was posted in Uncategorized and tagged Bibliotheque Nationale De France, Central Europe, Czech Artist, Economic Climate, Houk, Johannes Faber, Joseph Sudek, Kertesz, Man Ray, Modernists, Moholy Nagy, Paris Photo, Photography Auctions, Press Announcement, Self Portrait, Sotheby S, Trip To Paris, Vintage Gallery, Vintage Pieces, Vintage Sales on November 24, 2010 by Tim Clark.